» Are the Cottages for you? Red Mountain Cottages are located at the end of four miles of bumpy dirt road. A four-wheel drive vehicle is not necessary, but the rocky surface requires careful, slow driving, adding 15-20 minutes to the drive down to Highway 92. So plan your trips away from the cottages with this in mind. Our power is generated by the sun and stored in a bank of large batteries, but you will probably not notice any difference from conventional electricity. There is plenty of power to operate computers, play music, charge your cell phone, etc. No special adaptors are necessary for using your computer and related appliances. 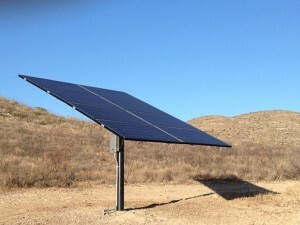 Our battery system is large enough to power two cottages, but we ask guests to conserve electricity while here, especially during rare cloudy days when the amount of sunlight on the panels is reduced. Night-time lights and refrigeration draw the most power. You will notice that our cottages do not contain toasters or hair dryers–appliances that contain heating coils which draw a tremendous amount of power from the batteries. Therefore, hot water and cooking ranges are heated with propane gas. 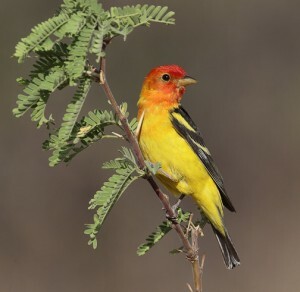 Because Red Mountain Cottages are centrally located to the very best birding areas in Southeast Arizona, they offer a perfect homebase for your birding pilgrimage. Enjoy day trips to the Huachuca canyons (Ash, Carr, Miller, Ramsey, and Garden), the San Pedro River riparian areas, Coronado National Memorial, Whitewater Draw, and the world-class birding destination of Portal and Paradise, AZ. World-famous Madera Canyon is a three-hour drive, and Patagonia State Park is less than 2 hours away. Wren, Curve-billed Thrashers, and several species of hummingbirds are just a few of our regulars. Warblers and sparrows (Black-throated, Botteris, Brewers, Cassains) grace us with their songs. Listen for the soft wingbeats of our local ravens, and listen to them call to each other as they soar overhead. Bird photographers can set up your tripod, camera and blind at one of several outdoor photo studios on our property. 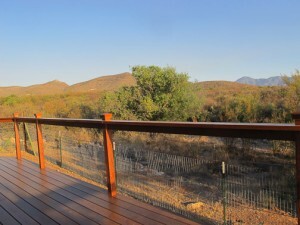 Red Mountain cottages offers a refuge of peace and quiet often sought by writers, musicians, and artists who require silence and solitude to do their best work. Away from the distractions of city life, your muses are free to work their magic. Let the dynamics of the desert ignite your imagination and stoke your natural creativity. We realize that while you unplug from the distractions of ordinary life, you may still need internet access for your work. Both cottages are equipped with 24/7 high speed WIFI internet. Here in the high Chihuahuan desert, we share our home with many other creatures who have lived here for eons, and have adapted to the harsh environment. 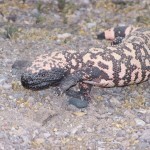 Driving along the road you may see a Mexican General grasshopper or a Gila Monster crawling along, or one of many varieties of snakes who thrive here. Many of the snakes are beneficial, helping to keep down populations of rodents as well as other, venomous snakes. 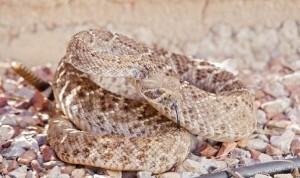 Rattlesnakes are dangerous and should be avoided, as their bites are extremely toxic, and can even be fatal. 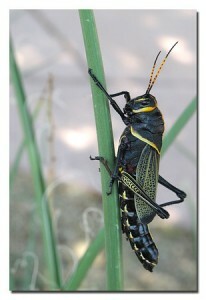 Active during the spring, summer, and fall months, they are extremely well camouflaged on the desert floor. They will not pursue you, but will definitely defend their territory. Make sure when walking outdoors that you keep your eyes on the ground around you at all times, and give them a wide berth. 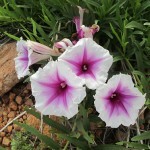 Be careful when picking up rocks or pulling weeds, as there could be critters hiding under there that bite or sting.